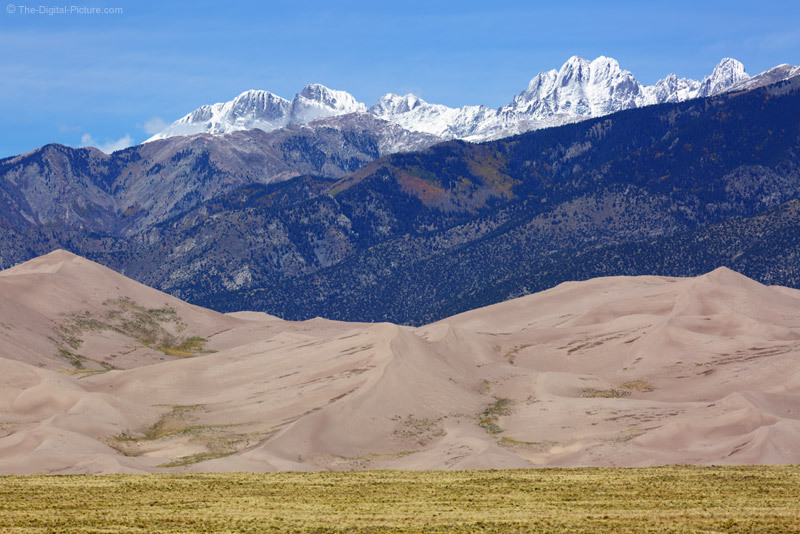 The sand dunes of Great Sand Dunes National Park and the beautiful Sangre de Cristo Mountains behind them are a common target for landscape photographers. To compress the dunes against the mountains requires a long distance perspective and if the dunes are to be large in the frame, a long telephoto focal length must be used. Fortunately, the road leading into GSDNP provides easy access to the that long distance perspective and sharp telephoto lenses are readily available. Unfortunately, there are other issues to be dealt with. Haze (including that caused by smoke, dust and air pollution) kills contrast and heat waves are potentially seriously damaging to image sharpness. The haze/air clarity problem is nearly always at least somewhat of an issue when shooting from this distance and the best way to combat haze during the capture is to use a circular polarizer filter. This filter will not completely eliminate the haze, but it definitely helps. The best way to reduce haze after the shot is by increasing contrast. Both were used for this photo. Far harder to control is the major issue I dealt with at this time of day in GSDNP and that is heat waves. Aside from moving closer (which changes the composition) or choosing another time of the day (or another day completely) to shoot, there is little that can be done about heat waves. Heat waves can be problematic at even short distances (and complicate outdoor comparison testing of lenses). Being at this location at the right time and day is ideal and both air clarity and heat wave issues can be mostly avoided with the right timing. Locals of course have that timing luxury, but I had only half of a day to spend at this location. I was intent on maximizing my time and embracing what I found. Many prefer to shoot this location early and late in the day (and I photographed until dark), but I found the dune shadows to be harsh at this time and also-liked the more-subtle tonation of mid-afternoon lighting on the dunes. In this case, I was able to run bands of color through the frame horizontally with the first snow of the season forming the top non-sky layer. Even though I was using the extraordinarily sharp Canon EF 200-400mm f/4L IS USM Lens and a circular polarizer filter, the end result has a soft painterly effect (visible at full resolution) thanks to the heat waves.